Food glorious food! Cheap is good, discounted is better, free is best! For sure food tastes better when you’re not the one paying. And when it’s your birthday you want to be spoilt. At these places you certainly will be. Enjoy all sorts of food, drinks, and deserts without having to pay a penny. A top tip though; have a backup email account ready to roll because you’re going to have to sign up to a few newsletters and the like. We’ve hooked you up with the spots that’ll shout you simply for being born. You beauty! Here’s some places where the good people of Perth will provide you with some tucker and you only have to pay in love. Need a buzz to prepare you for a big day of cashing in on free stuff? A free coffee from Gloria Jeans should do the trick. Simply join their eSipper Club and it’s yours! Want to pair your cuppa with a muffin? At Muffin Break they’ll sort you out with a free one when you join their membership club. If you’re too busy running around getting all your other freebies, no stress, your free muffin is valid for your whole birthday month. They’re too good to us! Smoothies and juices your thing? You’ll get a free Boost if you’re part of the Vibe club as well as plenty of other benefits all year round. Now we can vibe to that! Keen to spice it up instead? We’d never say no to a cheeky Nandos, especially if we aren’t paying! The peri peri chicken kings will give you a whole meal on your birthday so it’s definitely worth joining their PERi-perks program. Why wouldn’t you sign up, when let’s face it, no one goes to Nandos just once. Feeling more of a health kick? Sumo Salad offer a free regular size salad on your birthday for being a part of their Sumo Society; perfect for the fresh food fans! It’s surely time to cool down after all the heat of this free stuff. If that’s the case grab a free Cold Rock ice cream to appease your ice cream cravings. For something to warm your heart alongside your stomach, San churros will also sort you out with free churros on your big day. But hold up, desert is still going and did someone say doughnuts? In particular Krispy Kreme’s! You won’t just get one on your birthday they’ll give you a whole four pack of original glazed. All you have to do is make sure you join their ‘The Inner Circle’ first. The sugar rush will be so worth it. Now that’s a day! Happy Birthday to you. 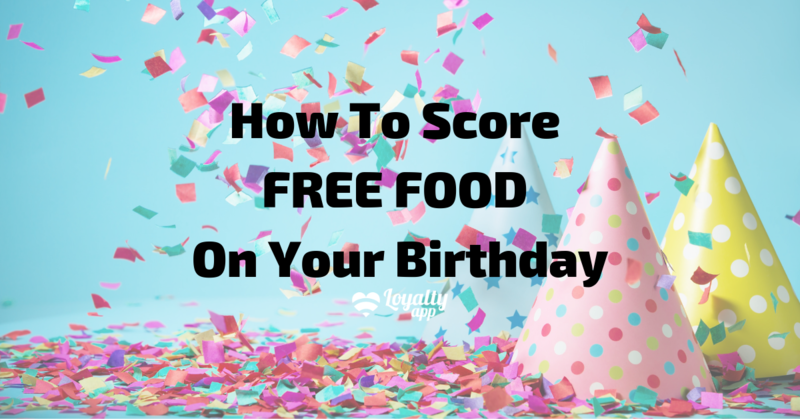 Want it to feel like every day is your birthday? When you join Loyalty app, you’ll get amazing offers all year round! Receive exclusive member deals on heaps of restaurants and cafes in WA. Earn Loyalty app dollars on every purchase you make at hundreds of WA’s best brands.